The use of duplex stainless steel is becoming increasingly widespread, and users are becoming more familiar with this type of stainless steel. This article introduces the characteristics of duplex stainless steel, and gives the basic principles and practical information of processing and welding duplex stainless steel, which is one of the difficulties in the application of duplex stainless steel. The contents include: the history of duplex stainless steel, metallurgical, corrosion resistance, mechanical properties, physical properties, technical conditions, quality control, cutting, forming, welding, application and so on. Full text is long, so it will be divided into several parts, welcome attention! Duplex stainless steel is a class of excellent corrosion resistance, high strength and easy to manufacture and processing, and many other excellent performance in the steel. Their physical properties range between austenitic stainless steel and ferritic stainless steel, but are closer to ferritic stainless steel and carbon steel. The resistance to chloride pitting and crevice corrosion of duplex stainless steels is related to their chromium, molybdenum, tungsten and nitrogen contents, and can be similar to 316 stainless steels or higher than seawater stainless steels such as 6% Mo austenitic stainless steels. All buplex stainless steel resistance to chloride stress corrosion cracking were significantly stronger than the 300 series of austenitic stainless steel, and its strength is also much higher than the austenitic stainless steel, while showing well plasticity and toughness. Duplex stainless steel manufacturing and processing of austenitic stainless steel has many similarities, but there also have important differences. Duplex stainless steel high alloy content and high strength requires to make some changes in the manufacturing process . This article is intended for end-users of processing manufacturers and manufacturing missions, and provides practical information on the manufacture of duplex stainless steels. This article assumes that the reader has some experience in the processing of stainless steel, so the comparison of the performance and processing of the duplex stainless steel and 300 series austenitic stainless steel and carbon steel is given. The process of manufacturing duplex stainless steel is different from general stainless steel, but it is not difficult. Duplex stainless steel has a history of nearly 80 years, it is a mixed microstructure, austenite phase and ferrite phase each about half. Early grades are alloys of chromium, nickel and molybdenum. In 1930, the first batch of forged two-phase stainless steel was produced in Sweden and used in the sulfite paper industry. These grades were developed to reduce the intergranular corrosion of early high-carbon austenitic stainless steels. In 1930 Finland produced duplex stainless steel castings. In 1936, the predecessor of Uranus 50 was patented in France. After World War II, AISI 329 stainless steel became a recognized steel and widely used in nitric acid plant heat exchanger tubes. 3RE60 is one of the first duplex stainless steel grades developed to improve the resistance to chloride stress corrosion cracking (SCC); later, both forging and casting duplex stainless steel grades are used in a variety of processing industries, including duplex steel pipes and tubes, containers , Heat exchangers and pumps. The first generation of duplex stainless steel has a good performance, but there are limitations in the welding state. The heat affected zone (HAZ) of the weld is low in toughness due to excessive ferrite, and the corrosion resistance is significantly lower than that of the base metal. These limitations make the application of the first generation duplex stainless steel limited to specific applications in non-welded states. 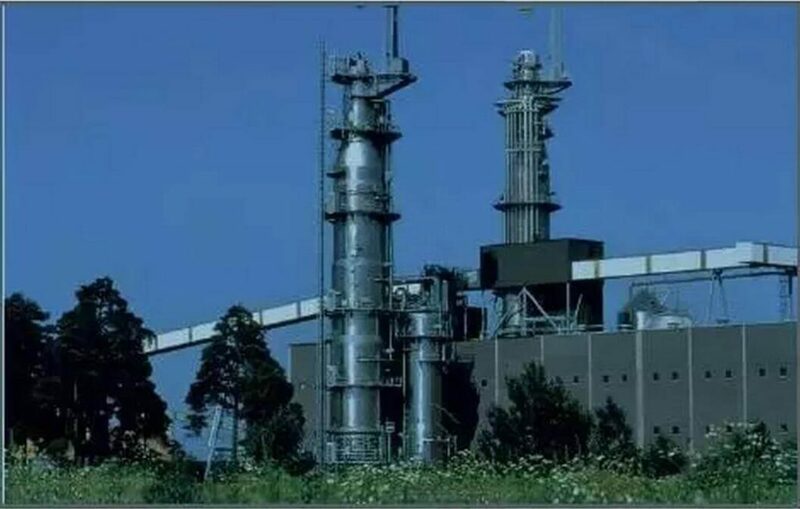 In 1968, stainless steel refining process, that is argon oxygen decarburization (AOD) invention, so that a series of new stainless steel production became possible. One of the many advances that AOD brings is the deliberate addition of alloying elements. The addition of nitrogen to the duplex stainless steel allows the toughness and corrosion resistance of the HAZ to be close to the properties of the base metal in the welded state. With the increase of austenite stability, nitrogen also reduces the formation rate of harmful intermetallic phase. Nitrogen-containing duplex stainless steel is called second-generation duplex stainless steel. This new commercialization began in the late 1970s, coinciding with the development of the North Sea offshore oil and gas fields and the market for excellent resistance to chloride ion corrosion, good manufacturing processability and high strength stainless steel demand. 2205 became the main grade of the second generation duplex stainless steel and is widely used in offshore oil platform gas pipe line and treatment facilities. Because of the high strength of this steel, so the wall thickness can be thin, you can reduce the weight of the platform, so that the application of this stainless steel has a great attraction. 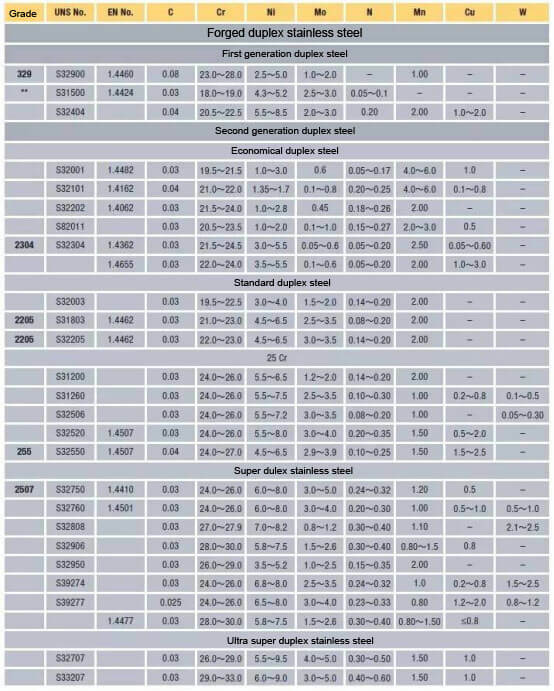 Table 1 shows the chemical composition of the second generation of forged duplex stainless steel and cast duplex stainless steel. For comparison, the first generation duplex stainless steel and commonly used austenitic stainless steels are also included. * The maximum value unless the specified range or description is the minimum. – Not specified in the standard. ** This kind of steel was initially not added with nitrogen, and was considered to be the first generation of non-nitrogenated duplex stainless steel. It is generally believed that the phase balance ratio of the duplex stainless steel is 30% to 70% when the ferrite is larger than that of the austenite. But duplex stainless steel is often considered to be roughly half of ferrite and austenite. In the current commercial production, the proportion of austenite tends to be slightly larger in order to obtain the best toughness and processing characteristics. The main alloying elements, especially the interaction between chromium, molybdenum, nitrogen and nickel, are very complex. In order to obtain a stable bilayer for processing and manufacture, it is important to note that each element has an appropriate content. In addition to the phase balance, the second major problem with the composition of duplex stainless steel and its chemical composition is the formation of harmful intermetallic phases when the temperature rises. The σ phase and the χ phase are formed in high chromium and high molybdenum stainless steels and are preferentially precipitated in the ferrite phase, and the addition of nitrogen greatly delays the formation of these phases. It is therefore important to maintain a sufficient amount of nitrogen in the solid solution. With the increase in experience in duplex stainless steel manufacturing, the importance of controlling the narrow range of components has become increasingly apparent. 2205 duplex steel (UNS S31803, Table 1) The initial set of ingredients is too wide, and experience has shown that the chromium, molybdenum and nitrogen contents of S31803 should be maintained in order to achieve optimum corrosion resistance and to avoid intermetallic phase formation Content range of the upper limit, which leads to a narrow range of improved 2205 dual phase steel UNS S32205 (Table 1). S32205 is the composition of today’s commercial 2205 duplex stainless steel typical ingredients. In this article, unless otherwise noted, usually 2205 refers to the S32205. The following briefly describes the effects of several of the most important alloying elements on the mechanical properties, physical properties and corrosion characteristics of duplex stainless steels. Steel chromium content must be no less than 10.5% in order to form a stable chromium-containing passivation film to protect the steel from atmospheric corrosion. The corrosion resistance of stainless steel increases with the increase of chromium content. Chromium is a ferrite forming element, and chromium in steel can promote the ferrite formation of the body-centered cubic structure. When the content of chromium in steel is high, more nickel is needed to form austenite or biphasic (ferrite-austenite) structure, and higher chromium content can promote the formation of intermetallic phase. Austenitic stainless steel has a chromium content of at least 16% and a duplex stainless steel with a chromium content of at least 20%. Chromium also increases the oxidation resistance of steel at high temperatures. The role of chromium is important, it affects the formation and removal of scale or tempering after heat treatment or welding. Duplex stainless steel pickling and removal of tempering color is more difficult than austenitic stainless steel. The synergistic effect of molybdenum and chromium can improve the ability of pitting resistance of stainless steel. When the chromium content of stainless steel is at least 18%, molybdenum in chloride-containing environment resistance to pitting and crevice corrosion is three times the capacity of chromium. Molybdenum is a ferrite forming element, but also increases the tendency of stainless steel to form intermetallic phases. Therefore, the molybdenum content of austenitic stainless steel is usually less than about 7.5%, and the molybdenum content of the duplex stainless steel is less than 4%. Nitrogen improves the ability of pitting and crevice corrosion of austenitic and duplex stainless steels, and it also significantly increases the strength of steel. In fact it is the most effective solid solution strengthening element and low cost alloying element. The improvement of toughness of nitrogen-containing duplex stainless steels is due to its higher austenite content and reduced intermetallic phase content. Nitrogen does not prevent the intergranular phase from precipitating, but delays the formation of the intermetallic phase, resulting in sufficient time for duplex stainless steel processing and fabrication. Nitrogen is added to high corrosion-resistant austenitic and duplex stainless steels with high chromium and molybdenum content to counteract their tendency to form a σ phase. Nitrogen is a strong austenite forming element, in the austenitic stainless steel can replace part of the nickel. Nitrogen can reduce the layer fault energy and improve the work hardening rate of austenite. It also enhances the strength of austenite by solid solution strengthening. Duplex stainless steels are generally added with nitrogen and the nickel content is adjusted to achieve proper phase equilibration. The ferrite forming elements of chromium and molybdenum formate elements with austenite and nitrogen phase equilibrium in order to obtain biphase structures. Nickel is an element that stabilizes austenite, and nickel promotes the transformation of the crystal structure of the stainless steel from the body-centered cubic structure (ferrite) into a face-centered cubic structure (austenite). Ferritic stainless steel containing little nickel or nickel-free, duplex stainless steel containing nickel as low as medium, such as 1.5% to 7%, 300 series austenitic stainless steel containing at least 6% nickel (see Figure 1, 2 ). The addition of nickel delayed the formation of harmful intermetallic phases in austenitic stainless steels, but the retardation of nickel in duplex stainless steels was far less effective than nitrogen. The face-centered cubic structure makes the austenitic stainless steel excellent in toughness. Nearly half of the duplex stainless steel is austenitic, so the toughness of the duplex steel is significantly higher than that of the ferrite stainless steel. 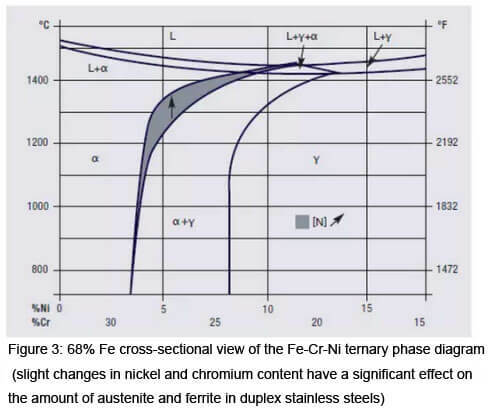 Fe-Cr-Ni alloy ternary phase diagram is the guide diagram of duplex metallurgical behavior. From the ternary cross-section diagram of the iron content of 68% (Figure 3), it can be seen that these alloys solidify with ferrite (α), and when the temperature drops to about 1000 ° C (1832 ° F), part of the ferrite is converted into Austenite (γ) (depending on alloy composition). At lower temperatures, ferrite and austenite in the equilibrium state have little or no further change. It can also be seen from Figure 3 that the effect of nitrogen is increased. From the thermodynamic point of view, because the austenite is from the ferrite transformation, the alloy can not skip the austenite equilibrium state. 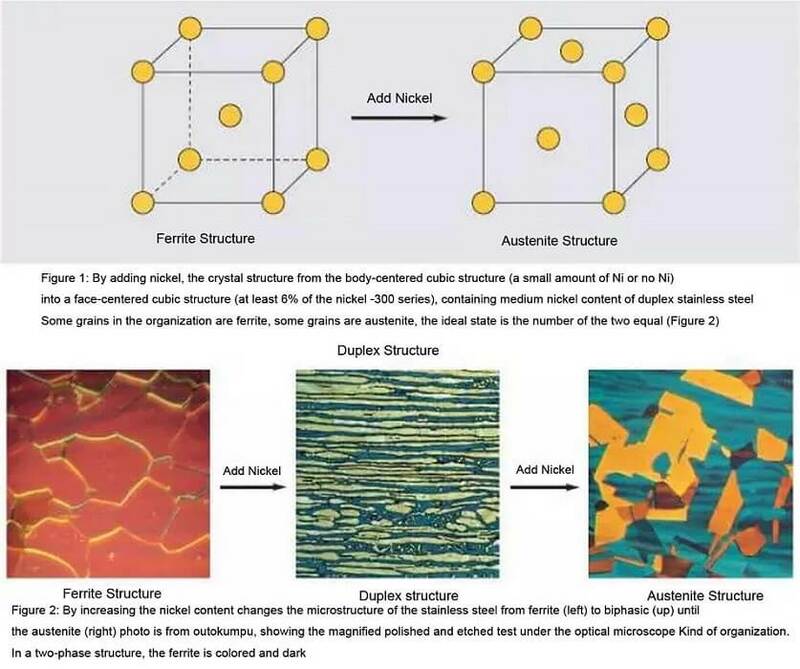 However, when continuing to cool to a lower temperature, carbides, nitrides, σ phases, and other intermetallic phases are likely to become components of microstructures. T (Celsius) is the annealing temperature, 1050-1150 ° C, and the elemental content is in weight percent (wt%). In order to achieve the purpose of the ideal balance of duplex stainless steel, mainly by adjusting the chromium, molybdenum, nickel and nitrogen content, and control the heating operation. However, since the cooling rate determines the amount of ferrite that can be converted into austenite, the cooling rate after high temperature will affect the phase equilibrium. Since rapid cooling favors the retention of ferrite, it is possible to obtain more ferrite than equilibrium. For example, the use of low heat input to weld large cross-section products can lead to HAZ (heat affected zone) excess ferrite. Another effective effect of nitrogen is to increase the temperature at which austenite begins to form from ferrite, as shown in Fig. 3, which increases the proportion of ferrite to austenite. Thus, even under relatively rapid cooling conditions, the amount of austenite can almost reach the equilibrium level. For the second generation of duplex stainless steel, this effect can reduce the problem of excess of HAZ ferrite. 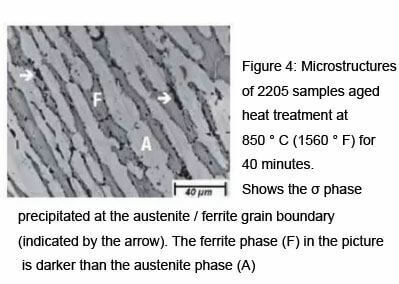 Since the formation temperature of the α phase is lower than the temperature at which the ferrite is converted into austenite during cooling (Fig. 4), in order to avoid the occurrence of the α phase in the metallurgical product, the annealing temperature can be controlled to ensure that the steel is quenched as soon as possible from the annealing temperature to prevent the cooling process In the formation of α phase. The required cooling rate is very fast and can be quenched with water. In actual manufacturing, excessive cooling rates are encountered only when the weld cross-section size is poor or when a thick section is welded with very low heat input. The α ‘phase in a duplex stainless steel is also a stable phase formed in a ferrite phase below 525 ° C (950 ° F), which is formed in the same manner as α’ in the whole ferrite stainless steel. Ferritic stainless steel is exposed to a temperature of about 475 ° C (885 ° F) for a long period of time, where the α ‘phase will cause loss of toughness at room temperature, which is the so-called brittleness of 475 ° C / 885 ° F.
In stainless steel, nitrogen as an alloying element means that chromium nitride may appear in the heat affected zone of the weld along the ferrite-ferrite grain boundary and the austenite-ferrite phase boundary. If it is a large number, when the poor chromium area is too late to compensate for the loss of chromium, chromium nitride will adversely affect the corrosion resistance of steel. However, due to the high nitrogen can promote the formation of austenite, austenite on the nitrogen solubility is high, so the second generation of duplex stainless steel rarely contain a large amount of chromium nitride. In addition, the second generation of duplex stainless steel carbon content is very low, therefore, usually do not need to consider the harmful effects of carbide. At some temperatures, the harmful σ phase, the α ‘phase, and the carbide and nitride phases can be formed in a few minutes. Therefore, the heat treatment at the time of processing and manufacture and use must take into account the reaction kinetics of the phases to ensure the desired corrosion resistance and mechanical properties. These two-phase stainless steel grades have been developed to achieve the best corrosion resistance and sufficient delay in the reaction, so that processing can be carried out smoothly. 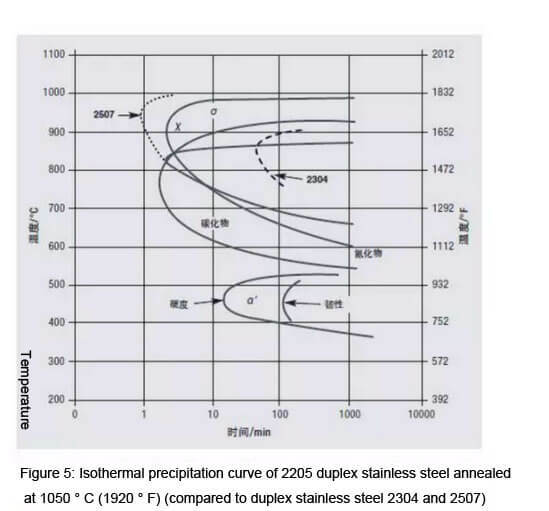 Figure 5 shows the isothermal precipitation of 2304, 2205 and 2507 duplex stainless steels. Chromium carbide and chromium nitride in the precipitation temperature began to precipitate the time is relatively “slow” for 1 to 2 minutes. Duplex stainless steel is slower to precipitate than ferritic stainless steel or high alloy austenitic stainless steels in part because of the high solubility of carbon and nitrogen in low nickel austenite phases and the delayed effect of nitrogen on carbide precipitation. Therefore, duplex stainless steel grades in the cooling resistance is relatively strong. The kinetics of the formation of carbides and nitrides in these grades are only to some extent by chromium. Molybdenum and nickel, the precipitation kinetics of all nitrogen-containing duplex stainless grades are similar to those of 2205 steel. The temperature at which the α phase and the χ phase precipitate are slightly higher, but the time for precipitation of carbides and nitrides is substantially the same. Chromium, molybdenum and nickel content higher duplex stainless steel grades of α phase and χ phase precipitation than 2205 faster; low alloy grade precipitation is slower. The dashed line in Fig. 5 indicates that the initiation time of the α phase and the χ phase in the higher alloying 2507 is earlier than that at 2304. The α ‘phase precipitates out of the ferrite phase, which hardens and embritates the ferrite phase. Fortunately, duplex stainless steel contains 50% austenite, this hardening and embrittlement of the harm is not as large as in the whole ferrite stainless steel. The loss (brittleness) of the ductility caused by the precipitation of α ‘is slower than that of hardening (Fig. 5). It takes a long time to brittle, and the α ‘brittleness problem is rarely considered in the process of manufacturing. But the upper limit of the use temperature of the material is constrained by the formation of α ‘phase. Because the long-term use of high temperature will make the steel room temperature toughness loss, pressure vessel design specifications have been established under the maximum allowable design stress under the upper temperature limit. The German TüV specification distinguishes between welded and non-welded structural parts, and its upper temperature limits are more conservative than ASME boilers and pressure vessel specifications. 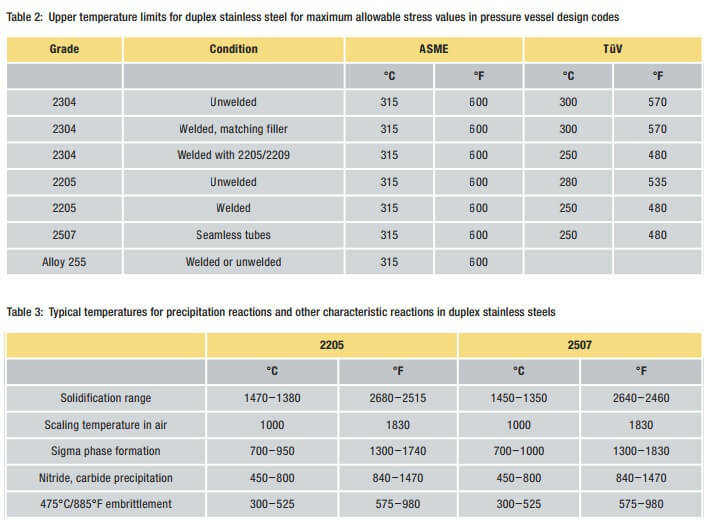 Pressure vessel design specifications specified in the various duplex stainless steel temperature limit in Table 2. Table 3 summarizes some of the important precipitation reactions and precipitation temperature limits for duplex stainless steels. « What are the advantages of stainless steel tube heat exchangers and brass tube heat exchangers?